Residents at a Pontypool care home are embracing café culture with daily cappuccinos and cupcakes following the launch of its on-site vintage tearooms. Luxury coffee, speciality teas, Welsh crumpets and Victoria sponge are just some of the daily treats being rustled up at Rowan House’s new ‘Panteg Pantry’ tearooms – completely free of charge. There’s even a ‘cream tea day’ once a month for those residents who can’t say no to a dash of Welsh clotted cream and a home-baked scone. The Griffithstown care home, owned by the Summerhill Group, built the old fashioned tea shop in a corner of the main lounge, overlooking the canal, to give residents and their visiting families a café-style environment to catch up on the latest news. In addition to cakes, biscuits and hot drinks, the tea room’s shelves are stocked with jars of vintage sweets which are weighed out and put into bags with old fashioned scales to enable residents to indulge in their favourite childhood treats of liquorice, rhubarb and custard and rainbow sherbet. The innovative idea has been so successful that other care homes are now considering a similar facility. Care Forum Wales' chair, Mario Kreft, said: "This is an utterly brilliant idea and it's no surprise that the Panteg Pantry tearooms are such a big hit with the residents and their families. "I know that other care organisations have been very impressed and I would not be surprised to see a few other tearooms popping up across Wales." Grandmother-of-one Elizabeth Vowles, 76, who officially opened the facility alongside care home manager Liz Richards-Calnon, enjoys nothing better than tucking into her lactose-free apple cake, hand-prepared by the home’s cooks, in the tearooms as she receives her daily visit from her 82-year-old husband Donald, a retired teacher. “It’s the best thing since sliced bread,” said the former newsagent who grew up in Croesyceiliog. “It’s like being in a nice café somewhere. My husband comes in every day to see me so we go to the tea shop and have our cuppa together. “It’s lovely to see families enjoying the tearooms. It’s doing its job of bringing people together. It has everything from chocolate eclairs and sponges to cupcakes, crumpets and scones. My husband really enjoys it and I have absolutely no complaints, it’s a lovely place. “It’s ideal for me because I have a lactose-intolerance and have a special diet and they don’t mind accommodating me as well as everybody else. “I also like to keep up on all the gossip in the home but usually I know everything already!" The idea for the tea rooms came from care companion Owen Cook. Staff approached the care home directors who were more than happy to fund the project. A local joinery firm was hired to build the old fashioned counter and shelving at a cost of £3,000. All of the cakes are all homemade by the home’s cooks Jean Evans and Julie Carter, and are served throughout the day by the carers, as and when the residents place an order. “The kitchen staff are all very inventive and keep the ideas fresh,” said activities coordinator June James, 56, from Blaenavon. “We encourage our visitors to come up to the bar and order tea for the residents and themselves. A member of staff is always behind the counter to serve. “The tea shop provides another stimulus for the residents; the sweet jars are all filled with brightly coloured sweets and the whole setting encourages them to take part and get involved. “We have vintage scales and weigh out the sweets in little bags. 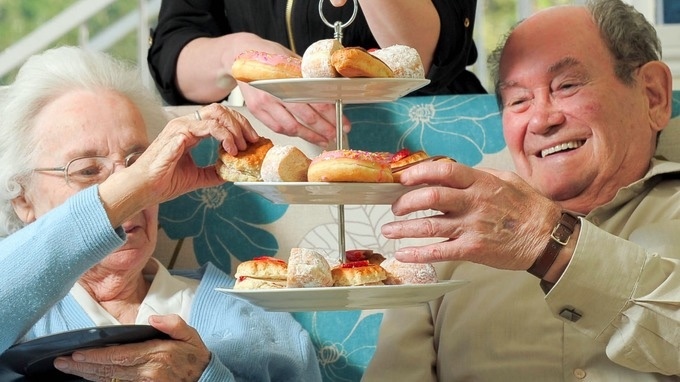 From a dementia point of view, it’s a very stimulating experience and encourages the residents to eat and drink a little bit more which is another aim. June has found a supplier of retro sweets in Pontypool and pays a regular visit to buy the sweets identified in the residents’ conversations. She explained that it was another way in which the home was pushing person-centred care to enhance the residents’ enjoyment of the home and create a vibrant atmosphere. “It has really enhanced the residents’ lives and gives them another social venue,” she said. “We set it in the lounge area so it’s comfortable and there are plenty of chairs already. “It’s completely free of charge. There’s a donation box on the counter but it’s up to everyone’s discretion. Quite often when a big family comes in and order lots of cakes they like to donate something but no one is ever asked to donate. “The staff love it because they take part and get involved as well. We all have the odd cake here and there. As soon as the residents and their families are served staff are welcome to have a cake, there’s always more than enough to go around.